Two beacons with orange flames denote one of the oldest methods for long-distance communications, and they form the focal point of the 11th Signal Brigade’s Unit Crest (it is also called a Distinctive Unit Insignia). Here they also represent the number “11,” as in the numerical designation of the brigade. 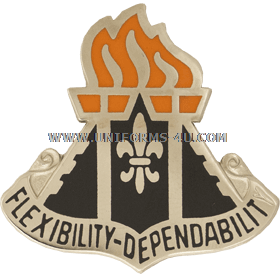 A fleur-de-lis recalls the unit’s service in Europe during World War II, for which it earned three military honors that are represented by the black fields formed by the partition created by the beacons. A scroll containing the motto “Flexibility-Dependability” forms the base of the crest. Just as with the unit’s CSIB, orange and white are used because of their traditional association with Signal Corps emblems and insignias.